Dubai is an amazing food arena which offers distinctive choices to diverse people; that come here from every corner of the world to live by or to visit the fascinating land of sand dunes. One thing that is most special about the food life of the city, is that it offers everything that you even think of eating; regardless of the clock. Ranging from western to eastern and southern to northern, this conurbation has a bounty of options in each genre of food that you are going to opt for. Here you will find plenty of preferences in international, national and even regional menus. This shows that it does not even miss out a niche and equally serves that demand of individuals and masses. One typical illustration is the South-Indian community and their savours that are pleasingly embraced by the city. There are a great number of refined South Indian restaurants in Dubai that serves amazingly flavorful and affordable food. Dubai has an inclusive range of small and medium South Indian restaurants that offer you everything from Dosa, Pongal and Idli to Appam. Here you can locate a broad assortment of South Indian indulgences arranged by exceedingly gifted culinary specialists and served to you in an appealing dining atmosphere. 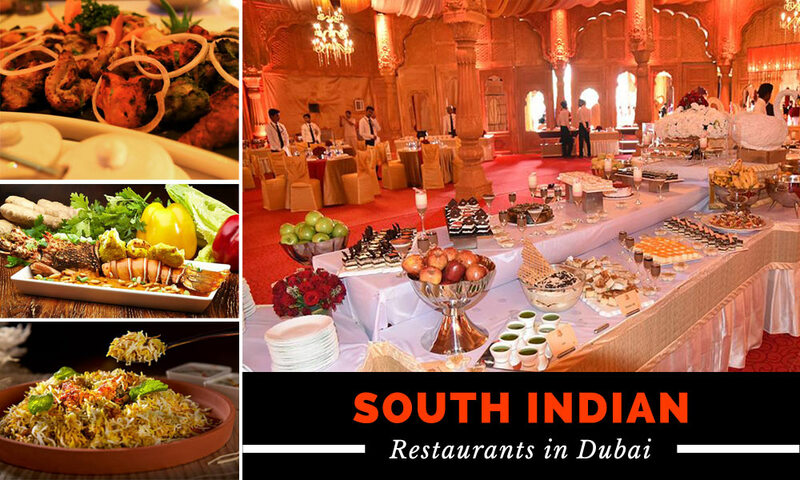 Dubai allows you to find diverse South Indian eating options that will be idyllic for quality, ambiance and price. Mentioned here are the best South Indian restaurants in Dubai that offers you the best variety of eating options. Aappa Kadai Restaurant is the mecca for those who love to indulge in South Indian cuisines in Dubai. This is one of the most loved restaurants among South Indians, Indians, as well as in other tourists and residents. Everything on Aappa Kadai’s menu is delectable and you have such a variety of mouth watering choices to look over! Something that you ought to totally get your hands on is the Masala Dosa, Onion Pakora, Egg Masala Appam and Koondal Porichathu. However, die-hard non-vegetarian could give a try to Murgh Tikka and Mutton Biryani that are just out of this world. An estimated cost for two would be around AED 70. Aappa Kadai is situated at Al Karama, Opposite Lulu Centre, near Karama Park; and also at Dubai Marina, Shop # 3, Diamond Building 6. Another branch is placed in the Discovery Garden, shop 4 & 6, Building 18, Zen Cluster 2. It is unquestionably one of the best South Indian eateries in Dubai. The two most vital characteristics of South Indian cuisines are that they are delicious and low-priced, and both of these features are beautifully blended at this cool South Indian restaurant in Dubai, called Kamat. Try not to go to the basic insides, the proprietors have spent their exertion on enticing your taste buds rather than an extravagant couch set or a graffiti fixtures. Kamat is a true vegetarian restaurant with a comprehensive menu, however you might also run with dishes such as Uttapam, Upma, Chicken Tikka Masala and Malai Kofta. You won’t return baffle from this amazing South Indian restaurant in Dubai, located at Mankhool, next to Sharaf DG, Kuwait Street, Dubai. Other branches are located at Dubai Internet City and King Faisal Street Sharjah. The place will averagely cost you AED 70 for 2. Nadumuttam may not be the cheapest one in our rundown, however, its menu and administration is perfect! Their Obbattu and Koondal Porichathu are popular among the South Indians living in Dubai! It is a small eatery located behind the Park Regis Hotel, Opposite Bikanerwala, Al Karama, Dubai and is really renowned for its Indian and South Indian food. So if it’s all the same to you spending somewhat more on delicious and healthy nourishment and having one foodie night of your life, then this South Indian eatery is an absolute visit! Average order would cost you around AED 70 for two persons. Unique like its name, the flavor of this eatery will make your taste buds dancing wilder. Food at Calicut Paragon is absolutely to die for, that come unswervingly from the hands of highly skilled culinary artists. It also has an enthralling interior, good music and lively ambiance. The place worth a visit to enjoy a typical South Indian meal at highly affordable price. The eatery is situated opposite to Lulu Centre, Al Karama – Dubai. Average meal for two estimated at AED 100 for two persons. The astounding interior settings, amazing Indian music playing and the potent aroma of Indian spices! A really scrumptious picture right! Moreover, not only this, but the costs is pretty pocket benevolent as well. Kovalam has flown its justly professional team undeviating from South India and the result is their 100% authentically flavored signature dishes. These are those things that will make you grin and be fulfilled by your eatery choice. Pick any entrée from their super inclusive menu and you will see why too many people visit this South Indian eatery every now and again. It is situated at the Lobby Level of the President Hotel, Trade Centre Road – Al Karama, Dubai. These are some of the best South Indian restaurants in Dubai you should try. They not only offer an authentic South Indian cuisine, but a great ambience as well. If you have experienced food at one of the above mentioned South Indian restaurants in Dubai, please share your experience by adding comments below.